With Benefit of the Doubt, Greg Boyd has written a personal, pastoral, philosophical, and theological book that aims to rehabilitate our understanding of faith. Boyd gives the reader an all-access pass into his life. He reflects on details from his childhood. He talks about his life-changing encounter with Christ as a 17-year-old at a Pentecostal church. He opens up about how he lost his faith a year later when he started college. He remembers how he was "overwhelmed by innumerable intellectual objections," and he could find no "adequate response" (97). He talks about how he returned to faith because of the utter sense of meaninglessness he found in a nihilistic view of the world. And he expresses in candid detail how his faith was altered after a night of screaming at the sky. Boyd is the senior pastor at Woodland Hills Church in St. Paul, MN. It's no surprise, then, that his writing reflects the heart of a pastor who wants to see people live faithfully in the world. More to the point of this book, he sees the "certainty-seeking" view of faith as an obstacle to living faithfully because it's a flawed view that assumes the more psychologically certain you are, the stronger your faith is. Over against that view, Boyd offers what he calls "covenantal faith," which is "not about striving for certainty, but about faithful living in the face of uncertainty" (77). One of his observations in this vein rings particularly true to me. Many churches combine a certainty-seeking view of faith with a House of Cards view of faith that thinks if any particular belief or doctrine is doubted or denied then the whole thing will collapse. Christianity becomes a package deal, a pre-selected set of beliefs that a person must accept (or reject) as a whole. I agree with Boyd when he comments that "it is this model that the church by and large continues to give young people, which goes a long way in explaining why roughly sixty percent of young people walk away from their faith sometime after high school" (42). "Because many of these students have been taught to think about faith with only 'in or out,' 'all or nothing' categories, they feel like they have no middle ground on which to stand and think and pray and believe...so they leave." While students leave their faith for a variety of reasons, I think Boyd is correct in naming an inflexible idea of faith as one of the culprits. Boyd is no stranger to philosophy. His book, Satan and the Problem of Evil, features significant and thoughtful engagement with a variety of philosophical views. In Benefit of the Doubt, he outlines numerous reasons why seeking certainty or equating faith with certainty is a quest in the wrong direction: it makes a virtue of irrationality; it has an un-Christlike picture of God; it makes faith into a kind of magic; it tends toward hypocrisy. Boyd also turns to Charles Peirce, a 19th century philosopher who is remembered as the "father of pragmatism," to unpack what true faith looks like. Contrary to what many people think, beliefs don't exist apart from our lives in the world. If they did, then we could believe something and it could have no impact on how we live. Peirce argued that beliefs determine how a person responds to certain circumstances. "If a person isn't willing to act in a way that reflects their belief, they don't really believe it, even if they claim to" (129). Boyd was a professor at Bethel University for sixteen years, and he incorporates quite a bit of theology in this book. Ultimately, he wants readers to make Jesus the foundation of their faith, and recognize Jesus as the ultimate revelation of God's true character. Much like my own faith journey, Boyd explains how he finally realized that his reasoning about the Bible and Jesus had been backward: "Rather than believing in Jesus because I believe the Bible to be the inspired Word of God, as evangelicals typically do, I came to believe the Bible was the inspired Word of God because I first believe in Jesus" (159). As the book moves toward its conclusion, Boyd spends time explaining and defending his Christocentric view of God, outlining the connections between imagination and life, and looking a few verses in the Bible that seem - at first glance - to equate faith with certainty (or at least an absence of doubt). I really enjoyed reading this book. Boyd and I have shared some of the same experiences with this topic, so I was very encouraged by the proposals and conclusions that he offers. 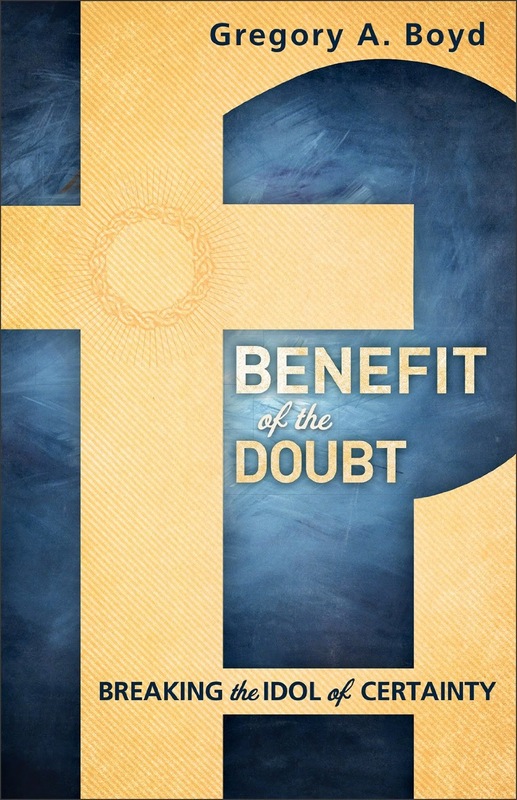 Benefit of the Doubt has a lot to offer college students, as well as adults who experience cognitive dissonance when what they learn, what they see, and what they experience bumps up against the faith they hold so dear. Disclaimer: I was provided a review copy of this book from Baker Books.